Some of my friends are on versions of low-carb diets and I cannot help but marvel at their determination. I suppose the dramatic weight loss is good for motivation, but how, I wonder, do they skip all the things I love: bread, rice and pasta? Easy, they tell me. After a while, the body just does not want these things any more. They get sugar- induced headaches when they eat cake. I remember going low carb years ago. My dreams were filled with visions of croissants, baguettes and roti prata. After a couple of weeks, I caved in and never tried it again. The problem is that if I have to give up one kind of food, that will be the only kind I crave. It could be carrots, bittergourd, candy or char kway teow. Say I cannot have it and that is all I will want. I have learnt over the years never to deny myself something, within reason. If I am craving fries, I will have some really good thick cut ones and then I am fine for months. I do not have chye tow kueh or fried carrot cake often, but occasionally, I indulge when I cannot stand it anymore. Ideally, I would like to eat it once a week but that is not going to happen any time soon. Recently, during a late-night text conversation, my friend and I, glued to our couches after a busy day, talked about what we were eating versus what we really wanted to eat. I was hankering for Korean barbecue, but was at home eating char siew buns and drinking iced green tea. Later, I had the pulp of four passionfruit. Oh, joy. My friend was stuck in the same situation. She was chowing down on plantain chips and contemplating a big bowl of Greek yogurt. None of us were anywhere close to feeling satisfied. "What I really want is fried chicken," she texts. That immediately made me crave it too. "The Korean kind?" I texted back. "I am craving chicken karaage more than Korean," came the reply. So naturally, a couple of days later, I made myself some chicken karaage, to sate the craving. Some people will call what she did inception. How apt. Chicken karaage is the Japanese version of fried chicken. I like my fried chicken bone-in but karaage is made with boneless, skin-on chicken. It cooks quickly and easily, and never feels like a grease bomb. If you want to sin, do it properly, I say, so I use chicken leg or thigh meat. They always end up juicy after a bath in hot oil. 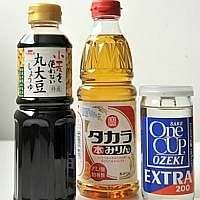 The marinade is easy and uses Japanese staples such as shoyu; mirin, a sweet rice wine; and sake. Ginger juice tames any gamey flavour in the chicken. Some recipes tell you not to marinate the chicken longer than 30 minutes but I like the flavours to permeate the meat, and leave mine in the fridge overnight. The patience is rewarded when the perky aromas of shoyu and ginger juice waft out when I bite into a piece. Incidentally, the marinade is good for chicken chop too. Instead of cutting the chicken into chunks, marinade boneless, skin-on chicken legs or thighs, then roast at 180 deg C on a rack set in a baking tray for 35 to 40 minutes. The chicken will be juicy, perfect with rice and a salad or steamed vegetables, and kinder on your kitchen. But I wanted the crispness that comes only with deep frying, so I ploughed on. 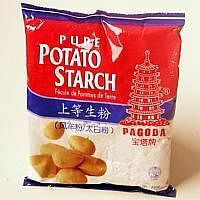 Potato starch is the best coating for it because it is milled ever so finely and produces a lightly crisp coating. I bought mine at Giant supermarket. If you cannot find it, use cornstarch instead. It will be just as, if not more crisp. To rein in some of the oil splatter, I use a medium- sized saucepan instead of a wok, filling the oil up to only the halfway mark. Peanut oil, with its high burning point, is my choice for deep frying. It is important not to crowd the pan with too many chicken pieces because they will steam instead of fry, and will not be crisp. Finally, I settled down with my plate of chicken, squeezed some lemon juice over it and tucked in. When I went back to the kitchen, I was glad that my craving had been licked. The clean-up was not funny. 1. Rinse the chicken under running water. Pat dry with paper towels. Using a pair of kitchen shears, cut the chicken into chunks. Place in a medium glass mixing bowl. 2. Peel the ginger by scraping the skin off with a spoon. Grate the ginger finely. Scoop up the pulp with clean hands and squeeze over the chicken. Discard the ginger fibres. 3. Add the shoyu, sake and mirin. Mix the chicken well with the marinade. Cover the mixing bowl with cling film and refrigerate overnight, or marinate at room temperature for one hour. 4. Before cooking, place the marinated chicken in a colander to drain the marinade. 5. Spoon the potato starch onto a large rimmed plate. Pour peanut oil into a medium saucepan so it reaches halfway up the pot. Place the pot over medium high heat. Line a large plate with several layers of paper towels. 7. Crack the egg into a small bowl and whisk it with a fork. 8. Place the chicken pieces back into the mixing bowl. Add the egg and mix well with fork and spoon. 9. Test to see if the oil is hot enough for frying: Place a pair of cooking chopsticks into the oil so it sticks straight out of the saucepan. If little bubbles float up quickly along the chopsticks, the oil is ready. 10. Dredge the pieces of chicken with the potato starch and slip them carefully into the oil. Turn them with the cooking chopsticks and fry until golden brown. Cook the chicken in batches, say four to five pieces at a time. Do not crowd the pan. 11. Drain chicken on a plate lined with paper towels. 12. Cut the lemon into wedges. Place a pile of shredded cabbage (if using) on a serving platter, place the chicken on the platter and serve immediately with lemon on the side to squeeze over.